Paxton M. Girtmon (born 1967) holds Bachelor's and Master's Degrees in Music Education (both with honors) from Northwestern State University, Natchitoches, LA, and a Doctorate of Musical Arts in conducting from the University of Southern Mississippi, Hattiesburg, MS. After moving to Georgia, Dr. Girtmon became the Associate Director of Bands at Fort Valley State University, Fort Valley, GA, where he directed the Fort Valley State University Symphonic Winds and co-directed The "Blue Machine" Marching Band and Pep Band. Later he was Assistant Professor of Music at Texas Southern University, Houston, TX (1998-2001). There he led the renowned "Ocean of Soul" Marching Band, and directed the Texas Southern University Wind Ensemble, Pep Band, and Saxophone Choir. 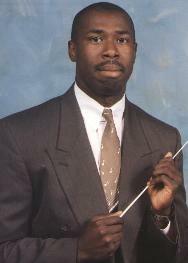 The Texas Southern University Wind Ensemble, under the baton of Dr. Girtmon performed at the 2001 National Association for the Study and Performance of African-American Music (NASPAAM), in Birmingham, AL. He was Associate Director of Bands/Coordinator of Music Education, and Assistant Professor of Music at Jackson State University, Jackson, MS. Dr. Girtmon is currently Director of Bands/Associate Professor of Music at Belhaven College, Jackson, MS, where he oversees the Marching, Pep, and Concert Bands, as well as the large and small ensembles during the spring term. Dr. Girtmon has performed with the Shreveport Symphony and Northwestern Natchitoches Symphony. He has also performed with legends such as Ray Charles, Pete Fountain and Doc Severinsen. Dr. Girtmon has published a number of articles, has lectured frequently on African-American Music, and is a sought after band clinician and adjucator. He is a member of The College Music Society, The National Association for the Study and Performance of African-American Music (NASPAAM), The National Association for African-American Studies and a number of other academic and professional organizations.